The Twenty-fifth Anniversary of Baalis Sanford Lodge is being held at a time when national and world events of great import are taking place. We are in the midst of a world war, the proportions of which could not have been thought possible at the institution of the Lodge in 1917. Yet the petitioners for the Lodge came to the ceremonies of institution, after reading in their evening papers that on that very noon President Wilson had asked Congress to declare war on Germany, and many of them wondered if this was an auspicious time to think of starting such a new venture. We little know what the future has for this Lodge, any more than did the Brothers of twenty-five years ago, but it may be well at this time to review some of the events and highlights which we believe have contributed to the well-being of the Craft through this quarter century, and to dedicate ourselves anew to the preservation of the heritage that is ours, and to the quickening of our sense of obligation to the Lodge, to the Fraternity and to our Country. In 1916 there were two Lodges in Brockton - Paul Revere Lodge, which had been established in 1856, sixty years before, and St. George Lodge, which had been established in 1877, thirty-nine years before. Both Lodges were larger in membership than ever before and the officers of both were kept busy conferring degrees upon a large number of candidates. At the Quarterly Communication of the Grand Lodge held on June 14, 1916, the Grand Master, Most Worshipful Melvin M. Johnson, devoted a considerable part of his address to the matter of the size of Lodges and the need of more and smaller Lodges. Much discussion arose in Brockton among those active in Masonic affairs as a result of this part of the Grand Master's address, as to whether or not another Lodge should be established in the City. The outcome of this discussion was a meeting on Friday, January 19, 1917, of the Past Masters of Paul Revere and St. George Lodges, called by Right Worshipful Brother George A. Thatcher, then District Deputy Grand Master of the 29th Masonic District, to consider the matter of a new Lodge in Brockton. There were present at this meeting: R. W. George A. Thatcher, D. D. G. M., R. W. William H. Emerson, R. W. Myron L. Keith and Worshipful Brothers David W. Battles, John A. Jackson, Francis E. Shaw, Albion H. Howe, Frank H. Reynolds, Charles B. Lawrence, John H. Gordon, George A. Warren, Walter E. Johnson, David Perkins, Albert C. MacGregory, George M. Howard, A. Everett Cushing, John M. Mosher, H. Clinton Atwood and Bernard B. Winslow. Evidently the details had been thoroughly discussed informally in advance, for at this meeting it was voted unanimously that a new Lodge should be formed; that a committee be appointed to prepare a petition to be sent to the Grand Master asking for a dispensation; that the matter be presented to Paul Revere and St. George Lodges for their approval; that the name of the proposed Lodge should be Baalis Sanford, in honor of the only Brockton Mason who up to that time had held the office of Grand Master, and also the initiation fee and yearly dues were agreed upon. The next meeting of the organizing group was held two weeks later, on Friday, February 2, 1917. Right Worshipful Brother William H. Emerson, as Chairman of a special committee appointed at the previous meeting, reported that Worshipful Brother Albert C. MacGregory, Past Master of Paul Revere Lodge, had consented to serve as Master of the proposed new Lodge, and that Rev. Brother Dudley H. Ferrell would serve as Senior Warden. These names, together with Brother Frank E. Cobb for Junior Warden and Brother Charles D. Nevins for Treasurer, were unanimously agreed upon at the meeting. The selection of other proposed officers was left to the special organization committee. It was decided that the regular meetings of this new Lodge should be held in the rooms of Paul Revere Lodge on the first Monday of each month. Parenthetically, let me say that the first by-laws adopted February 4, 1918, changed this to the second Wednesday of each month, and this has been in effect ever since. Another meeting was held Friday, February 23, 1917, at which Right Worshipful Brother William H. Emerson, Chairman of the special committee, reporting for the committee, recommended a list of officers which was unanimously approved. After the officers had taken their respective stations, the Lodge was opened on the Third Degree in due form, and the first application for the degrees was received from A. Eugene Alden. At the second meeting of the Lodge, the first applicant was elected and six more applications were received. The first Brother raised in the Lodge was Henry Alston Evans, who received the Master Mason Degree on September 6, 1917 — ahead of the regular time, by special dispensation of Most Worshipful Leon M. Abbott, Grand Master, because he was in the service of his country and daily expecting to be called away. For the next year, the officers were busy perfecting themselves in the ritualistic work and conferring the degrees on twenty-four accepted applicants, under the direction and instruction of Worshipful Brother MacGregory, assisted by a number of the Past Masters and active officers of Paul Revere and St. George Lodges. Worshipful Brother MacGregory had been recently in the East of Paul Revere Lodge, where he had been a most able and accurate Master, and the new Lodge was most fortunate to have its start under his experienced direction. Several times during this period the Most Worshipful Grand Master granted dispensation for a shortening of time between degrees for candidates in the service, with the result that the officers had ample opportunity to become proficient in their ritualistic work, occasionally working degrees on more than one night in the same week. The Grand Lodge was opened in Ample Form in an anteroom of the Masonic Apartments at 52 Center Street, Brockton. The Grand Master was waited on by the Master and Wardens designate of the new Lodge, who informed him that Baalis Sanford Lodge U.D. respectfully asked to be constituted. The Grand Master replied that he would immediately proceed with the ceremony. After the return of the Master and Wardens designate, the petitioners formed in two lines, one on the North, the other on the South of the lodge-room, and the Most Worshipful Grand Master and other officers of the Grand Lodge were received. Grand Master Leon M. Abbott, with the other officers of the Grand Lodge, then constituted Baalis Sanford Lodge with full form and ceremony and the Grand Marshal proclaimed that the Lodge had been duly registered in the Grand Lodge of Massachusetts. The ceremony of installation of officers followed. The Most Worshipful Grand Master installed the Master, the Right Worshipful Senior Grand Warden, the Senior Warden, the Right Worshipful Junior Grand Warden, the Junior Warden, the Right Worshipful Grand Treasurer, the Treasurer, the Right Worshipful Grand Secretary, the Secretary, the Worshipful Grand Chaplain, the Chaplain, and the Right Worshipful Deputy Grand Master, the remaining officers. The Grand Master made an eloquent address, concluding by presenting the Worshipful Master, Rev. Brother Dudley H. Ferrell, a Henry Price Medal for distinguished Masonic attainments. Of these fifty-seven Charter Members, twenty-five were Past Masters, fifteen of Paul Revere Lodge and ten of St. George Lodge. At the first annual meeting of the Lodge held on May 8, 1919, reports showed that there had been ten regular and eighteen special communications, with an average attendance of thirty-seven; that seventeen had received the Master Mason Degree, and that seven members were serving with the colors. The Treasurer reported all bills paid and a balance in his hands of $879.34. Worshipful Brother Dudley H. Ferrell, who had been installed at the Charter Night a month before as the first Master under the Charter, having accepted a call to a parish in Montreal, and having moved from the city, was not a candidate for reelection. He had been Master of the Lodge only twenty-eight days. However, while the Lodge was under dispensation, and while Worshipful Brother MacGregory was Master, he had presided in the East at least once in the conferring of each of the three degrees, and he previously had served many years most faithfully as Chaplain of Paul Revere Lodge. I mention this because of some talk which was made when later he was a candidate for the office of Grand Master. The Lodge held its first public appearance when it attended a vesper service at the South Congregational Church, on the evening of May 19, 1918, on invitation of Rev. Brother J. Stanley Durkee, joining with the members of St. George Lodge for this service. A notable occasion for Baalis Sanford Lodge was the first official visitation of Right Worshipful George A. Thatcher, District Deputy Grand Master for the 29th Masonic District, on November 20, 1919, as this visit completed the full round of the ceremony of recognition by the Most Worshipful Grand Lodge. The first Past Master's jewel to be given by the Lodge was presented on this occasion to Worshipful Brother Dudley H. Ferrell. At the official visitation of Right Worshipful Warren S. Shaw on November 3, 1920, he was given a check for $135.00, which was $1.00 per member contribution of Baalis Sanford Lodge to the George Washington Memorial Fund, being the first Lodge in Massachusetts to contribute 100% of its quota for this purpose. It was reported at the annual meeting on May 11, 1921, the Lodge being four years old, that with a membership of 158, there were no outstanding dues unpaid. At the meeting on January 4, 1922, a reception was given to Right Worshipful Brother Dudley H. Ferrell, who had recently been installed Deputy Grand Master, and the honored guest took part in the ritualistic work of the third degree. The fifth anniversary of the Lodge was observed with two events, a Ladies' Night and an historical observance. At the latter, the Secretary's records show that an historical address written by the Chaplain, Rev. Brother Warren P. Landers, was read and it was voted that the thanks of the Lodge be extended to the Chaplain and that a copy of the address be placed on file. Unfortunately, diligent search has failed to locate a copy of the address. The years from 1921 to 1923 were most active ones, there being outstanding speakers and entertainment programs at nearly every regular meeting of the Lodge, such as R. W. Brother Allan T. Treadway, R. W. Brother Frederick G. Katzman, R. W. Brother Frederick W. Hamilton, Brother Frank G. Allen, Brother Wilfred R. Wilson, Brother Geronimo Suva from the Philippines, Dr. Teyhi Hsieh, Brother Marshall J. Perrin, and a fraternal visit by M. W. Arthur D. Prince, Grand Master. The Lodge has been honored by visits by the Grand Master on a number of occasions. The Charter was presented by M.W. Leon M. Abbott on April 10, 1918. M. W. Arthur D. Prince made a fraternal visit on June 14, 1922, when R. W. Dudley H. Ferrell, as Deputy Grand Master, installed the officers. M. W. Dudley H. Ferrell was given a reception as Grand Master by his own Lodge on January 24, 1923, and visited the Lodge on at least three other occasions as Grand Master, in spite of the fact that he was then living in Swampscott. M. W. Frank L. Simpson made a fraternal visit to the Lodge on April 13, 1927, and this evening we are honored by the presence of M. W. Albert A. Schaefer. The records of any Lodge are to a large extent the details of applications and conferring of degrees, and those of this Lodge are no exception. The records show that at one period the officers and members exchanged fraternal visits with several other Lodges, the visiting officers assisting in the ritualistic work of the evening, and many enjoyable meetings were held. This type of activity seems to have been overlooked in recent years. On May 28, 1923, a Chinese dinner was served and for a while the Brethren tried to eat with chopsticks. When some were beginning to despair of being able to get sufficient nourishment, knives, forks and spoons were brought to the tables and all were happy. The first Past Masters' Night occurred on December 5, 1928, with the first eight Masters of the Lodge all present and taking part in the work. Past Masters' Nights have been held frequently since then, also the installations have been conducted by the Past Masters on a number of occasions. On March 9,1932, Baalis Sanford Lodge celebrated the George Washington Bicentennial, when the Brethren, joined by their families and friends, enjoyed an illustrated talk by Brother J. Hugo Tatsch on "Washington, the Citizen and Mason," and an address by Rev. Brother Horace F. Holton on "Washington's Message for Today." Because of a fire in these quarters, it was necessary to hold the meeting of April 12, 1933, in the quarters of St. George Lodge. During the year of 1933, the Grand Lodge of Massachusetts celebrated its 200th Anniversary. Baalis Sanford Lodge took special notice of this occasion in a fitting manner. The Lodge was also well represented in the great meeting in Boston Arena in recognition of this event, as well as attending the services at the Old North Church. At the twentieth anniversary of the Lodge, Right Worshipful Ralph Lowe, Jr., Acting Grand Master, made us a fraternal visit, and in his talk to the Lodge, told of the life and Masonic record of the distinguished citizen of Brockton for whom the Lodge had been named. A recent entry in the records may be recalled by the few who were present and may be of interest to others here this evening. On February 14, 1940, the Secretary recorded that "owing to the severity of the storm, and the inability of the Master to reach the quarters until rescued from a snow bank by three of the Brethren, the opening of the Lodge was somewhat delayed. However, upon their safe arrival, the Lodge was opened on the third degree in Form at 9:40 o'clock." We have been a two-year Lodge, that is, the Masters, with kw exceptions, have served two years, and this has been good for the Masters and good for the Lodge. Fifteen have served as Worshipful Master. All but two of them are living—Most Worshipful Dudley H. Ferrell and Worshipful Brother Frank E. Cobb. The first of the initiates of the Lodge to reach the East was Worshipful Brother Henry F. Weston, who was first installed Master twelve years after the institution of the Lodge. Two Brothers have served as Senior Warden and did not become Worshipful Master — Brothers Philip D. Richmond and Earl C. Swift. There have been but two Treasurers of the Lodge, Brother Charles D. Nevins, who served until 1931, and Brother Malcolm R. Arnold, who has served since then. We have had five Secretaries, nine Chaplains, three Marshals, only one Organist, Brother William B. Nash, and only one Tyler, Brother Arthur C. Dole, who has not missed a single meeting of Baalis Sanford Lodge in the twenty-five years of its existence. We have been active in helping to maintain the 41st Lodge of Instruction. One of our Past Masters, Worshipful Brother Henry F. Weston, has served as Master of the Lodge of Instruction, and Worshipful Brother Ralph W. Arnold is now serving as Senior Warden. We have endeavored to do our part in maintaining the Masonic Home and the Hospital, and to keep our members informed on the benevolent work of the Grand Lodge. We have been represented on the Board of Masonic Relief since 1929 by Worshipful Brother Harold S. Crocker, elected by the*29th Masonic District. From a start of fifty-seven Charter Members, the Lodge reached a membership in five years of 191; in ten years this had grown to 247, and after fifteen years the highest membership was reached—285. At the end of twenty years, it had dropped to 268, and today the membership is 257. Of the fourteen Past Masters of the Lodge, eight were Charter Members. This, my Brethren, I believe will complete the highlights of our Lodge history for the first twenty-five years, with the exception of the anniversary meeting this evening, which will be for the next historian of the Lodge to record. I hope I have covered all the outstanding events and that those who detect any errors or omissions will be charitable. It has been impractical, without making this historical sketch too long for your endurance, to mention the name of every one who has contributed to the success of the Lodge, as there have been actually hundreds who could be included. At the Twenty-fifth Anniversary of Baalis Sanford Lodge the interesting facts and events in the first twenty-five years of its life were contained in the history prepared at that time and published in the Grand Lodge Proceedings for 1942, pages 71-84. Therefore this history will review only a few of the highlights of that period before going into more detail about the second twenty-five year period. We recall that this Lodge was instituted at the time when war was declared on Germany, the start of the First World War. With two Lodges in Brockton, Paul Revere and Saint George Lodge, both large in membership, there was much discussion in Brockton about the need for smaller Lodges. 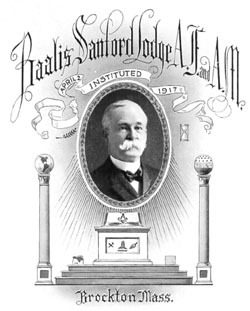 With the approval of the two local Lodges and the names of practically every living Past Master of both on the Petition to the Grand Lodge, things took the usual course leading to the Institution of Baalis Sanford Lodge on April 2, 1917. The Charter Night was on April 10, 1918, with Most Worshipful Leon M. Abbott, Grand Master, and a most distinguished suite of Grand Lodge Officers in attendance. The History of twenty-five years ago gives the details of this event, together with the lists of officers and Charter Members. It had been agreed that the name of the new Lodge should be Baalis Sanford, in honor of the Past Master of Paul Revere Lodge, obviously a Brockton man, who had held the office of Grand Master in 1903 to 1905. The first Master of the Lodge was Worshipful Brother Albert C. MacGregory who served during the year of Dispensation. He recently had been in the East of Paul Revere Lodge, where he had been a most able and accurate Master. Upon him devolved the responsibility of forming and fashioning this young Lodge which was most fortunate to have its start under his experienced direction. The years from 1917 to 1942 were most active ones. There were Official Visitations, outstanding speakers and entertainments, visits by presiding Grand Masters and other distinguished Masons, and Past Masters' Nights. From a start of fifty-seven Charter Members a membership of two hundred eighty-five was reached in 1932 and in 1942 at the Twenty-fifth Anniversary the membership was two hundred fifty-seven. The Twenty-fifth Anniversary of Baalis Sanford Lodge was held on April 15, 1942 and was attended by the Most Worshipful Grand Master, Albert A. Schaefer, and other officers of Grand Lodge, who were received by the Presiding Master, Worshipful Charles C. MacBride. Among those on the Grand Master's suite were Right Worshipful Myron L. Keith, Past Deputy Grand Master, a Charter Member of this Lodge and the District Deputy Grand Master of the Brockton 29th District, Right Worshipful Joseph W. Keith. A History covering the first twenty-five years of the Lodge was read by the present historian and the Grand Master and several members of his suite spoke, nearly all stressing the coincidence that the Lodge was instituted during the First World War and the Twenty-fifth Anniversary was being held during the Second World War. Of the nineteen Charter Members living at the time of the Twenty-fifth Anniversary, twelve were present at that event. The Thirtieth Anniversary of the Lodge was observed on April 2, 1947 as Past Masters' Night with Right Worshipful Edmund L. Seaquist as Presiding Master. On this occasion the first Master of the Lodge, Worshipful Brother Albert C. MacGregory, was in the East and other Past Masters of the Lodge filled all the other stations and conferred the Third Degree. All present thoroughly enjoyed hearing the excellent ritualistic work, particularly that of our senior Past Master, in spite of the lapse of thirty years since he had presided over the Lodge. On April 23, 1952 the Thirty-fifth Anniversary of Baalis Sanford Lodge was held and again with a Past Masters' Night. Because of the absence of the Grand Master from the State, the Deputy Grand Master, Right Worshipful Harold W. Sprague, was received as Acting Grand Master and on his suite were two Brockton Brothers: Right Worshipful Harold S. Crocker, Grand Standard Bearer, and Worshipful and Reverend James A. Davidson, Pastor of the First Baptist Church and Grand Chaplain of Grand Lodge. The Lodge was instituted at the Masonic Quarters at 52 Center Street and continued to hold its communications there until and including that of June 13, 1962. The first communication at 279 Prospect Street, these quarters, was the 454th Regular Communication which was held on September 12, 1962. This was in the small Lodge room on the floor above, this addition not having been built at that time. The Dedication of the recently enlarged quarters which included the dining room and kitchen in the lower floor and this large Lodge room above the banquet hall, was held on October 20, 1964, jointly with Paul Revere Lodge. Both Lodges were opened before the dinner. Following the dinner the Brethren assembled in the large Lodge room with Worshipful George Andrews, Master of Paul Revere Lodge and Worshipful Kenneth H. Simpson, Master of Baalis Sanford Lodge in the East and other stations filled by the officers of Paul Revere Lodge. The Grand Master, Most Worshipful A. Neill Osgood, was received accompanied by a large suite of Grand Officers who then assumed the stations in the Lodge for the purpose of Dedicating the new quarters and unveiling the corner-stone of the building. This was carried out in a most impressive manner by the Grand Officers who used the ancient ritual which included the pouring of corn, wine and oil on the carpet. There were speeches by the Grand Master, several Past Grand Masters and other Grand Lodge officers, all of whom complimented the Brethren of Brockton upon their fine new quarters. The reception committee for this evening consisted of the Past Masters of both Paul Revere Lodge and Baalis Sanford Lodge with Right Worshipful Harold S. Crocker as Chairman. At the 476th Regular Communication of Baalis Sanford Lodge held on November 11, 1964, the District Deputy Grand Master, Right Worshipful S. Forrest Kelliher, made a Fraternal Visit which was notable as it was a tribute to Right Worshipful Ralph W. Arnold for his many years of service to the Lodge. Right Worshipful Edmund L. Seaquist read a resume of the Masonic activities of Brother Arnold and Worshipful Brother Roger P. Lays the Chairman of this event presented Brother Arnold a desk set from the Past Masters, suitably inscribed, as a remembrance of the evening. At this Communication it was announced that a new set of Jewels to be worn by the Master and Wardens at Grand Lodge and at other proper occasions was to be presented to the Lodge by its officers in Brother Arnold's name. It may be of interest to note that the Regular Communication of the Lodge, March 8, 1967, was the 500th. In addition to these, there have been many more than 500 Special Communications through the fifty years. The membership of the Lodge is now 418. The first eight Masters of the Lodge had been Charter Members. The ninth Master, Worshipful Brother Henry F. Weston, was the first of the initiates of the Lodge to reach the East. He was first installed as Master twelve years after the Institution of the Lodge. There are four of the original fifty-seven Charter Members now living, namely: Brothers B. Harrison Cort, Harold S. Crocker, George W. Smith, and Harold W. Sprague. Four Past Masters of the Lodge have been Master of the 41st Lodge of Instruction: Wor. Henry F. Weston, R.W. Ralph W. Arnold, Wor. Alan F. Lays, Wor. Herbert M. Capen. R.W. Brother Harold W. Sprague is a wearer of the Henry Price Medal and R.W. Edmund L. Seaquist and Wor. George W. Smith are wearers of the Distinguished Service Medal. In preparing this History, the writer has been greatly aided by information and assistance given by our Secretary, Right Worshipful Ralph W. Arnold, who is now serving his twenty-eighth year in that office. Every Presiding Master knows what it means to him and to the Lodge to have a knowledgeable and helpful secretary, and Brother Arnold has been just that. The distinguished Mason for whom our Lodge was named read a History of Paul Revere Lodge at its Fiftieth Anniversary in 1906. I am pleased to close these remarks with an excerpt from that History of the Lodge which shares these quarters with us, written sixty-one years ago. "Brethren, my task is now completed. As we enter upon another half century of Masonic life, gratefully recognizing the guiding hand of an overruling Providence who has directed our steps, and led us in green pastures and by the still waters, we have confidence to believe that the same kind Providence will guide and direct us in the years that lie before us. 'May our past be an inspiration for the future — may the examples and devotion to the principles of Freemasonry, of those who prepared the way for our prosperity, deepen our own love for the same great truths, and as we face the duties and responsibilities of the unknown future, let us emulate the virtues and fidelity of the founders, and contribute our best efforts for the continued success of our noble institution. May another fifty years of prosperity, harmony and happiness be ours. May we continue to grow, not only in numbers, but in all those attributes that brighten and purify, that uplift and inspire the thoughts and lives of humanity." This page was last modified on 27 December 2018, at 10:46.